The world’s great cities can be both Jerusalem and Babylon. “Who can fathom the depths of London?” asked Peter Ackroyd in his monumental, 800-page attempt to do that very thing, London: The Biography. The book was a kind of occult history, an alternate version, the story of “a city that is built in the shadows of money and power … a city that is continually filled with the energetic display of people and institutions”. It is a book that Robinson, the imaginary intellectual invented by Patrick Keiller, would devour. In fact, he could easily have written it. Robinson first “appeared” in Keiller’s film London (1994) nearly 20 years ago. The 82 minute film was narrated by actor Paul Scofield over long shots of London life – streets, shops, docks, canals, building sites, bomb sites – all filmed without sound, by Keiller over the course of 1992. On the soundtrack, Scofield, billed simply as “the narrator”, describes his meetings with Robinson, an auto-didact. As it opens, the narrator has not seen Robinson in seven years; on screen, a luxury liner is docking on the Thames. By now, you may be reminded of several other films. It’s reminiscent of the opening scenes of Derek Jarman’s The Last of England (1987), a sad, mordant state of the nation essay film, with its Nigel Terry voice-over summoning up the dejected spirit of T S Eliot’s post-World War I epic poem The Waste Land, and its image of an approaching ice age as somehow apt for the cold narrowing of public life in the 1980s. Or it’s reminiscent of Terence Davies’ Of Time And The City (2008), much of which was told with the same kind of bitterness and humour, but which was more openly personal, a lament for a Liverpool that Davies no longer recognised. Or, it is reminiscent of Chris Marker’s San Soleil (1983), a more complex essay film and travelogue that is built around an imaginary exchange of letters. 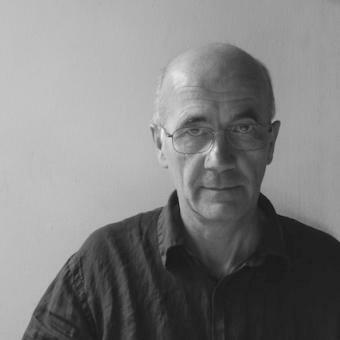 Keiller’s three Robinson films – London, especially – are funny. They are timely, even topical. They are politically vicious. They are unashamedly oppositional, and intellectual. They are influenced by the Parisian Situationists in their visions of what cities are and what they could be, of how public space and public life is marginalised; the second film, Robinson in Space (1997), even begins with the line, “Sitting comfortably, I opened my copy of The Revolution of Everyday Life …” – a reference to the Situationist work by Raoul Vaneigem. Its two characters also seem – in a way that seems more English than European – to be defeated already, by the weight of London’s history, by the persistence of the monarchy, by the triumph of money and the neoliberal economy. There isn’t much else they can do than look for traces in the past, moments when history went wrong. The narrator joins Robinson on his walks around London – this is walking as time travel (“Psychic landscaping, drifting and free association”). They look for traces of writers: Poe, Rimbaud, Sterne, Apollinaire, Baudelaire. But even as the narration – the imagined exchanges between Robinson and the narrator – becomes esoteric, the images stay persistently real. As such, the film also acts as an unofficial diary of 1992, the year of a slump. A camera is there when John Major stands outside 10 Downing Street after re-election and the narrator says, “It seemed there was no longer anything a Conservative government could do to cause itself to be voted out of office.” There are IRA bombs and pit closures. The historical city of London has been entirely colonised by finance, by “the armies of clerks and dealers”. Robinson and the narrator keep finding the monarchy occupying public spaces, and English heritage looks like the worst of fake traditions. Beyond Peter Ackroyd, there are contemporary literary parallels. Iain Sinclair’s obsessively detailed London books, London Orbital – in which the author walks the M25 – and Hackney, That Rose-Red Empire are inevitable ones. W G Sebald’s imaginary travelogues operate in the same kind of way, especially Austerlitz, where the relationship between the writer and the mysterious Austerlitz is eerily similar to the Robinson/narrator relationship. More recently, the Situationist term “psychogeography” has been picked up and popularised by Will Self, who is now a professor in contemporary thought at Brunel University in London, which even suggests that Keiller, Sinclair, Sebald and others could be the fathers of a whole new field of study. But Owen Hatherley, whose books Militant Modernism and A Guide to the New Ruins of Great Britain have a Robinson-ish quality (a mix of nostalgia and anger), suggests a better comparison: documentary maker Humphrey Jennings’ relatively little-known Pandaemonium: The Coming of the Machine As Seen by Contemporary Observers, a collage of early reporting of the British Industrial Revolution. It makes sense that the ancient cities London and Paris should be the capitals of this kind of psychogeographic work. But it’s also possible to watch London and think, what would a Christchurch version of this be like? The earthquake treatments have been done – and Gerard Smyth’s When a City Falls will never be surpassed as a record of how those minutes, and then weeks, and then months, felt – but there must be an opportunity now for an essay film that assesses Christchurch’s histories in an idiosyncratic and highly opinionated way, and considers its present, its empty spaces and its ruins, the impact of local and national politics. London would be the model. In London, Robinson imagines a future in which the early 90s economic slump has become so bad that the area around St Paul’s is reclaimed by artists and poets – which is a weird premonition of the Occupy movement. But the sequel, Robinson in Space, was more concerned with the rest of the country. It is now 1995 and Robinson is living in Reading, researching “the problem of England”. As before, history and esoterica – or its surviving traces – are set against the urban and semi-rural landscapes of the Thames Valley, the Estuary, Dagenham. Ports and transports are a motif: the distribution centres that appear on the outskirts of towns and the endless motorways that connect them, as though England’s only industries now are shipping, internal distribution and military manufacturing. The car manufacturers have been shut down or bought out. They drive through Cambridge, Dover, Southampton, Birmingham, Manchester, Halifax, Hull and Blackpool (Robinson likes Blackpool – as a surrealist, he digs the carnivalisation of everyday life). They hear a reading from Richard Jefferies’ 19th century post-apocalyptic novel After London on the car radio and briefly, even hopefully, mistake it for a documentary. By 1995, the Conservative government was close to exhaustion. England too looked exhausted. “I cannot tell you where Robinson finally found his utopia,” the narrator concludes. And then Robinson disappeared for close to a decade and a half. In a way, he has never really returned. 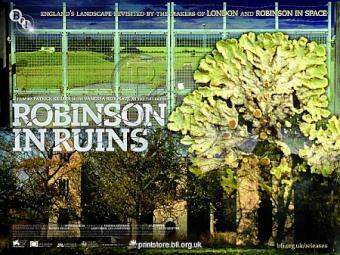 In the third, latest film – Robinson in Ruins (2010) – he is less present than ever. Vanessa Redgrave replaces the late Paul Scofield as narrator and the conceit now is that the film we are watching is pieced together from a box of film cans and notebooks Robinson left behind in a caravan. In what may be a direct nod to the Sebald connection, we are told that Robinson is not the man’s real name and nor was he English – he arrived from Germany in 1966, the same year that the real Sebald moved from Germany to Manchester, as described in the incredible “Max Ferber” section of The Emigrants. Robinson’s footage in the third film is pretty, picturesque. He has abandoned cities entirely and films fields of poppies, wheat, wild flowers, lichen spreading on a road sign, a spider on a web. There are few signs of human life and fewer words than before. The tone and pace are much more leisurely, presumably because there was no television funding this time (between the second and third Robinson film, Keiller and Tilda Swinton made a film about British housing, The Dilapidated Dwelling, that was TV-funded but never screened). Robinson remains the paranoid, self-taught scholar. As the banking crisis of 2008 unfolds, he is investigating the origins of British capitalism. The enclosures recur as a historically important moment – when public land became private. The British countryside also contains secrets: the RAF bases, the disappearing sites of US power, Greenham Common, even Harrowdown Hill in Oxfordshire, notorious because of the suicide of weapons inspector David Kelly in 2003. But the relative absence of human life in this footage does not correspond at all to an absence of politics – as Keiller explained in a 2008 essay, landscape photography is itself political, as it is “often motivated by utopian or ideological imperatives, both as a critique of the world, and to demonstrate the possibility of creating a better one”. It is as though Robinson only appears in times of crisis or economic slump and hibernates at other times. But he has persisted beyond the mysterious end of the third film. Keiller began in an art and architecture context rather than a film one, and it is to art that he has recently returned. In March, Keiller’s “Robinson Institute” opened for six months at Tate Britain in London. In a related interview, Keiller described Robinson as a literary device “to explore ideas that one might entertain but would not necessarily wholeheartedly adopt” – which sounds close to the fictional doubles used by Sebald. Throughout the show, visitors are taken on complex journeys connecting the disparate works to the history of capitalism and the economy in Britain. Keiller’s own photographs of lichen growing on a road sign to Newbury lead us to a photograph of nearby Speenhamland, a rural district remembered for its radical system of poor relief alleviating hardship for working people that had been created largely by a 1795 Act of Parliament. The legislation enabled employers to move the workforce around and now regarded as a cornerstone of capitalism. The act is detailed on parchment in a vitrine, while another contains a meteorite which fell in that same year — Robinson sees meteorites as harbingers of major historical events, of which, he notes, the 2008 financial crisis is the latest. Robinson’s interest was in the cities where capitalism was first built, and in the non-places where it now silently spreads: the distribution centres and container ports that are unvisited by practically anyone except Robinson and his narrator-companion, but which web Britain into the global market. These “non-places” are also the settings of the most recent Aki Kaurismaki film, Le Havre. Initially, Kaurismaki had a subject in mind but not a location. His subject would be the illegal trafficking of African refugees into Europe; to find the ideal location, the Finnish Kaurismaki reportedly drove the entire coast from Genoa to Amsterdam. Although a Mediterranean port would be a more realistic setting, the French port town of Le Havre had the right feel. Andre Wilms, who appeared in Kaurismaki’s La Vie de Boheme (1992), which is obliquely referred to in the dialogue, plays Marcel Marx, a shoeshine man on the streets of Le Havre. Kaurismaki veteran Kati Outinen, whose hangdog face is almost a visual representation of the famously depressing but unusually comic nature of the director’s films, plays his wife. One day, a shipping container is opened at the port and African refugees are found inside; Marcel looks after one, Idrissa (Blondin Miguel), a boy from Gabon. Only weeks after the first New Zealand theatrical release of a film by the brothers Jean-Pierre and Luc Dardenne – The Kid with a Bike – comes what must be the first New Zealand theatrical release of a Kaurismaki film. The stories and settings are not too dissimilar, either. The Dardennes have often been concerned with the illegal economies of Europe’s non-places – specifically within the Belgian industrial city of Seraing, on the outskirts of Liege – but their directorial choices tend to be starker, more documentary-like, less sentimental. The relative sentimentality and sunniness of The Kid with a Bike is an exception. Despite being “depressing”, Kaurismaki’s films have had a black sense of humour and a storybook quality – even, at times, a sweet centre. On the surface at least, that would be the case with Le Havre. It would be spoiling to say much more, other than to point out that Le Havre seems to be part of a dialogue with the expectations of melodrama, and even with the legacy of Robert Bresson’s investigations of good and evil, and the intervention of the miraculous. Where Kaurismaki differs from Bresson, of course, is in the deadpan sense that he may just be winding you up (his interviews are often funnier than his films). 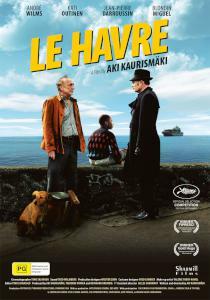 In the press kit, Kaurismaki even describes Le Havre as “unrealistic”. Equally, the director has announced that this is the first of a “port town” trilogy – but who can ever tell if he’s serious? *Patrick Keiller’s Robinson films are on DVD. Le Havre is released in New Zealand on May 31.